As you navigate the world of friction stir welding, you may wonder how to make the most of the tools at your disposal. 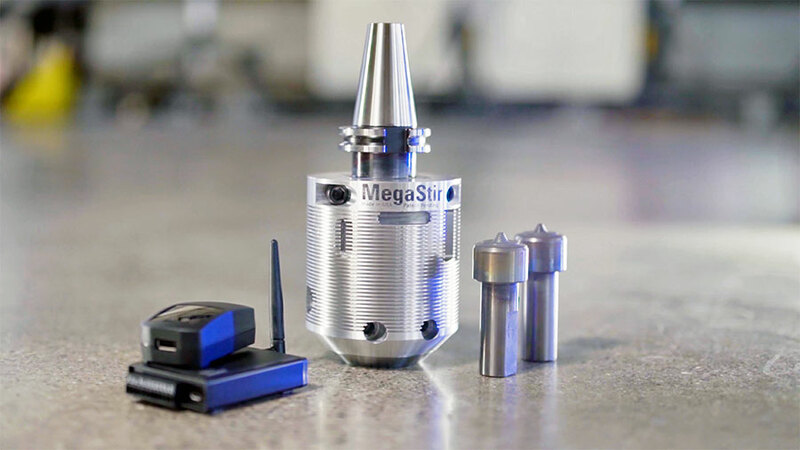 MegaStir offers tools ranging from applications for low, moderate, and high-temperature friction stir welding. While every user will have different methods of use for each of our tools. Here is a summary of recommended and practical applications for FSW tools. The H13 Tool Steel or MP159 is most commonly used for aluminum or magnesium based alloys. Any wear on the tool is dependent on the aluminum type being welded and its thickness. MP159 is a Ni, Co, multiphase alloy with a nominal chemistry of 25.5Ni-35.7Co-19Cr-9Fe-7Mo-3Ti-0.6Cb-0.2Al. Its higher yield strength of ~214 ksi (~1455 MPa) and tensile strength of ~235 ksi (~1600 MPa) at 896°F (~480°C) make it appear to be superior to H13. Densimet 176S is a tungsten-based alloy manufactured by powder metal processing, is easily machinable, and does not require heat treatment. Although not normally used at elevated temperature, the tensile strength of Densimet 176S at 1832°F (1000°C) is 35 ksi (240 MPa). Lanthanated Tungsten (La2O3W) At 1832°F (1000ºC), the yield strength of La2O3W is 52 ksi (262MPa). La2O3W is easily machinable. We recommend using cubic Boron Nitride (cBN) tool materials for FSW of high-temperature materials such as steels and nickel base alloys. Currently, there are four cBN tool materials to choose from as listed below. There are two issues to address for maximum tool life, i.e., tool wear and fracture. In general, to minimize tool wear, weld temperature should be kept to a minimum while still achieving a defect-free weld. During the tool plunge, the tool rotation rate is typically 800 to 1000 rpm. However, once the tool traverse initiates, the tool rotation rate should be reduced to ≤ 200 rpm and at times as low as ~100 rpm. Although these are very low tool rotation rates, MegaStir has produced defect-free welds in steels with these weld parameters for workpiece thickness from 3 to 19 mm. Tool travel speeds will be dependent on the weld depth. For example, for a 6 mm thickness the tool travel speed can be 4 to 12 ipm (1.7 to 5 mm/s) and for a 19 mm thickness, 2 to 4 ipm (0.85 to 1.7 mm/s). The table presented below lists weld parameters successfully used by MegaStir to create defect-free welds. In addition, if features of the cBN tool wear to the extent that weld defects occur, the tool can be re-profiled up to 4 times. With these weld procedures and with two re-profiles, MegaStir has welded up to 400 feet (122 m) with one tool. The four different cBN materials listed below have different wear resistance. Although not quantitative, the relative wear resistance of each is noted below. With regard to tool fracture, cBN materials are ceramics and are inherently brittle in tension or torsion. Thus, they are fracture sensitive. A tool spindle with a very low run-out 0.012mm is required to use cBN as an FSW tool material. Even when using a low run-out tool spindle, surface cracks will occur after some length of weld. These surface cracks are shallow, and the FSW tool will continue to perform without failure for a considerable weld length. During re-profiling, these surface cracks are sometimes removed. Although qualitative, the relative toughness or crack resistance of each of the cBN tool materials is listed below. In general, at this time, MegaStir recommends either Q60 or Q70 for most high-temperature FSW applications. MS80: 80% cBN with a metallic binder. Good wear resistance but relatively fracture sensitive. MS90: 90% cBN with a metallic binder. The highest wear resistance but the most fracture sensitive. Q60: A blend of 60% cBN and 40% WRe. Moderate wear resistance but has the highest toughness of the five cBN tool grades. Q70: A blend of 70% cBN and 30% WRe. Improved wear resistance with a small loss in toughness compared to Q60. Q90: A blend of 90% cBN and 10% WRe. Improved wear resistance with a loss in toughness compared to Q60. MegaStir has limited experience with Q90. 25mm pucks allow for material thicknesses up to 10mm depending on material type. Typical weld parameters used by MegaStir to create defect-free welds in high-temperature alloys.